Basketball enthusiasts can quote John Wooden's winning basketball statistics, but leaders around the world can quote his character-centered leadership principles. 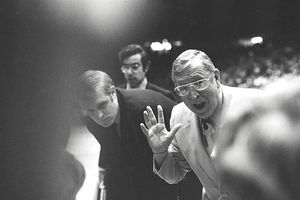 While people are impressed with Wooden's 10 NCAA championships in 12 years and his 88 consecutive wins, it is the coach's unwavering commitment to building character, demonstrating integrity, and focusing on values that most impressed those who worked with him and those who admired his work from afar. Numerous books, movies, and leadership training programs have been written about Coach John Wooden's legendary leadership. Wooden stands out because he didn't just have a leadership style, he had deeply-rooted leadership beliefs that other leaders in a wide variety of management roles wanted to adopt and adapt for themselves. "Talent is God given. Be humble. Fame is man given. Be grateful. Conceit is self-given. Be careful." "It isn't what you do, but how you do it." "I deeply believed that the teacher and coach who has the ability to properly plan... from both the daily and the long-range point of view together with the ability to devise the necessary drills to meet his particular needs for maximum efficiency, has tremendously increased his possibility of success." "I would spend almost as much time planning a practice as conducting it. Everything was planned out each day." "Although I wanted my players to work to win, I tried to convince them they had always won when they had done their best." It's not so important who starts the game but who finishes it." "A player who makes a team great is much more valuable than a great player." "Learn as if you were to live forever; live as if you were to die tomorrow."